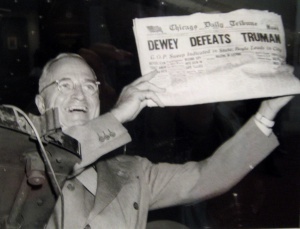 Most Americans are familiar with the photo of President Harry Truman, in triumph after the 1948 presidential election, holding up the Chicago Daily Tribune with the headline declaring his opponent NY Gov. Thomas Dewey was predicted to win. The pollsters and the news reporter, in the early years of surveys, screwed up. Truman pulled in 303 electoral votes and 49.6% of votes cast, Dewey received 189 and 45.1% and Strom Thurmond collected 39 and 2.4%. The pollsters used a poor sampling methodology, and the industry made adjustments going forward. And, it happened again! In the May 7th, 2015 British general election, late public polls indicated the Conservative and Labour parties were in a close race, 34% each. Nope. The Conservatives collected 38% and Labour 31%. So, what happened? The British Polling Council (BPC) and the Market Research Society just released their 115-page “Report of the Inquiry into the 2015 British general election opinion polls.” Click here for the report. The BPC is an association of polling organizations that publish polls. The self-described objectives are to ensure standards of disclosure that provide consumers of survey results that enter the public domain with an adequate basis for judging the reliability and validity of the results. The news media places far too much significance on the horserace early in the campaign season. It is a lazy way for the news media to get headlines. The result: Donald Trump touting horserace polls and voters – who do not have time to delve into the details (isn’t that a role of news reporters?) – following the supposed front runner. Campaign professionals, including veteran news reporters and editors, know that in the early phases of a campaign, the guts of the polls are more important than the horserace. These are the private polls that are not shared with the public. What is the voter sentiment? What are they seeking in their next leader? These are the questions that are supposed to identify trends such as who is angry in the electorate, how many of them, reasons why they are angry and what will appeal to them. Without the deeper analysis, the Republican Party and the media were blind-sided by the bluster of Donald Trump. And, the result is an American political system in upheaval and hand-wringing among domestic voters and international viewers. However, late in a close campaign, the horserace does matter. In the final weeks of an election, the campaigns should be well in tune with the electorate and, based on the horserace, know how to deploy their best messages and resources for Election Day. These final public polls – supposedly the result of our modern knowledge economy — are critical in providing stability in any changeover in national governance. But, what if the horserace polls are wrong? That is a problem. If the polls do not match the results, it raises questions as to the validity of the election results. There are known problems in polling, often relating to the increased costs in reaching random samples of voters. Many voters are in cell-phone only homes; reaching these voters is expensive. People with landlines are also answering surveys at increasingly lower rates, which also raises the cost of conducting a voter survey. Are there other reasons, beyond cost, that are driving these problems? And, for some additional context, there is also the challenge of polls not being able to track voters deciding late in an election (this can be done, but not something I have seen public polling organizations do – anyone want to hire me to do this?). So, this inquiry matters. The public election horserace polls provide stability to the electorate and world economies. And, the reputation of polling has similar implications among the corporations and organizations that rely on surveys. As voters and users of survey research, we need confidence in our survey systems. So, this inquiry will provide important lessons of the source of the problem, and, hopefully, guidance for resolving the problem. Reliable public election polling is expensive. The pollsters in the UK took shortcuts that do not work if you are looking to accurately predict a national election. If you want to poll for the public for a national election and focus on the horserace, spend your budget on less but more accurate polling. The problems were avoidable. The BPC could not find a singular problem other than the polls consistently had too many Labour voters and too few Conservatives. They even worked through a process of elimination, going through eight other possible sources of consistent error (i.e. intentional misreporting, major changes in late-deciding voters, voters misleading in their answers, unexpected changes in voter turnout, inaccuracy in expected voter models, etc.). They found no errors to account for such a high and consistent disparity. THE ULTIMATE PROBLEM IS COST. The BPC provides criticism of both online surveys and telephone surveys that were conducted prior to the UK election for cutting corners due to cost in ways that changed the composition of survey respondents. ONLINE SAMPLES ARE POOR FOR ACCURATELY MEASURING GENERAL POPULATION ATTITUDES, TO THE POINT WHERE FIXING THE PROBLEM ADDS SO MUCH COST THEY MIGHT AS WELL CONDUCT A TELEPHONE SURVEY. Many of the polls examined by the BPC were conducted online with opt-in panels—people who agree to be included in online polling samples. It is significantly less expensive than a random digit dialing (RDD) telephone survey. There have been internal arguments in the opinion research world for decades about whether the opt-in panels can accurately mimic the accuracy of RDD. From the mid-1960s to mid-2000s, RDD was the gold standard for most closely achieving true random sampling of a first-world voter population (the new gold standard includes manually dialing cell phone numbers). Along with the randomness of being picked for a survey in RDD (as opposed to opt-in panels), the use of a flesh-and-blood interviewer is considered essential to minimizing the inherent sampling and other errors in a survey. A professional interviewer is trained to get people to respond who might initially decline to participate. There is no magical statistical formula for filling the differences in opinions between people who readily agree to take a poll and people who need some cajoling to take a poll. Some firms conducting studies online have tried different statistical techniques to patch together a proxy for a random sample. Some claim their models are adequate, but, to me, the failure in the UK demonstrates otherwise. While these methods are decent for testing experimental hypotheses in surveys, I believe they are flawed when trying to provide the general public a reliable estimation of election preferences. TELEPHONE SAMPLES CAN ALSO HAVE PROBLEMS BUT ARE MORE EASILY FIXED. It is well-documented that RDD telephone surveys of voters have become increasingly expensive because they get fewer responses from voters with landline telephones (people are less willing to respond and they have more ways to spend their evenings than answering telephone calls) and they have to hand-dial cell phone numbers. The BPC report calls on future telephone surveys to increase the hours in which they call, require more callbacks and calls to people who do not initially respond, increase the percentage of cell-phone only users, and to spend more days completing their surveys. These are all tried-and-true elements of a well-conducted survey, and it is a shame that pollsters sharing important civic information have cut costs to the point of damaging public trust. Do we have the same problem in the United States in our election polls? The opinion research industry went through a similar self-examination after the 2008 Presidential election and reached similar results. The good news is public polls are mainly conducted by telephone and do not have a consistent error. The bad news for news outlets is they are very expensive. As I have mentioned before, I hope this forces more reporters to examine polls more deeply than the horserace so we better understand the good and the bad in the minds of voters. I have not seen this addressed in the BPC report, but why were major British newspapers reporting on online polls — known to have flaws — for their national elections? On some final notes, it is likely polling budgets for news agencies have been overstretched with the long drawn out primaries in both parties; we will see fewer public polls through the conventions, and possibly in the fall election season. As I have shared before, Gallup announced they made a business decision to no longer conduct, at their own expense, public election polls focused on the horserace.